(C) ESI Photography. Kevin Babington and Shorapur on their way to a $200,000 Sunshine Grand Prix FEI CSI 4* win. 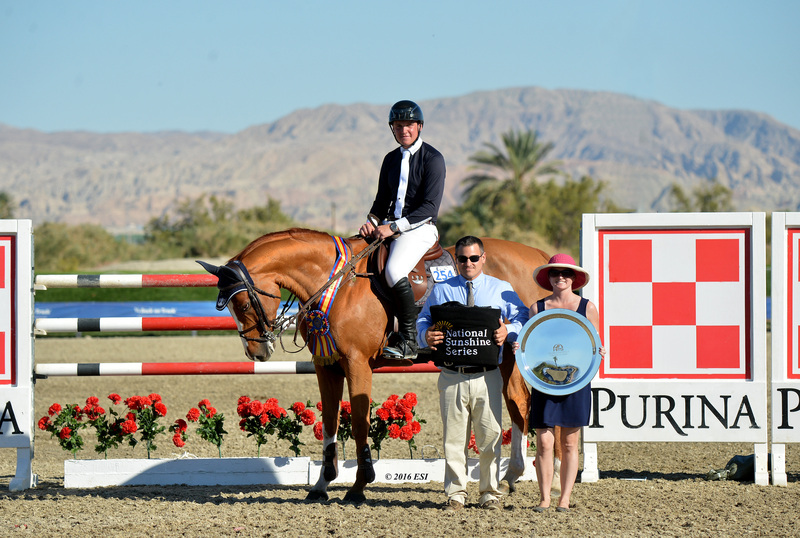 Thermal, CA (November 17, 2016): The second week of the 2016 National Sunshine Series included a combination of spectacular events, great weather and three FEI CSI-4* classes along with a $50,000 USHJA International Hunter Derby. Riders, trainers and owners, along with their family and friends, settled at HITS Desert Horse Park to enjoy the experience. The atmosphere was electric for a great, season-ending horse show. 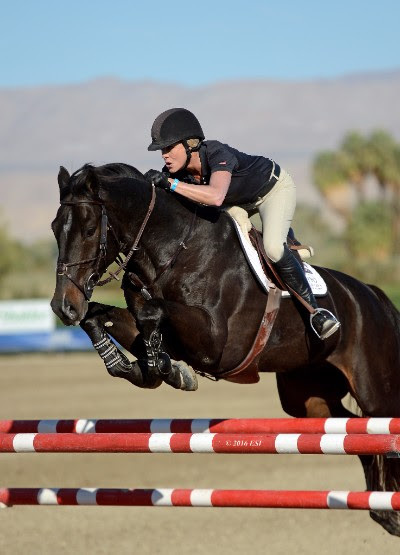 Not only did HITS Desert Horse Park play host to a competitive FEI Week and Hunter week, but young riders turned out for the inaugural NCEA Junior Hunt Seat Medal West Coast Finals, as well as the Zone X Equitation Finals. Spectators filed into the stands to witness the grand finale of the two-week series on Sunday. The weather was just right for a big afternoon competition, and the jump-off would prove nothing short of exhilarating. Kevin Babington scooped up the win with his dynamite mare Shorapur, owned by Shorapur, LLC. In a seven horse jump-off, Babington came in as the last trip in the order to steal the victory with a fault-free round in 43.23, just a hair quicker than second-place Nayel Nassar aboard Lordan with a 43.66-second round. “It was a strong, [FEI] 4* Grand Prix on Sunday, I thought the course suited the class and there were plenty of talented riders and horses there,” said Babington. “I really enjoyed being out here for both weeks.Obviously the weather is really nice— the horses seem very happy here, they’re relaxed. Third place went to Mexico’s Enrique Gonzalez piloting Chacna—they too clocked in clear, but in 43.73, just behind Nassar. 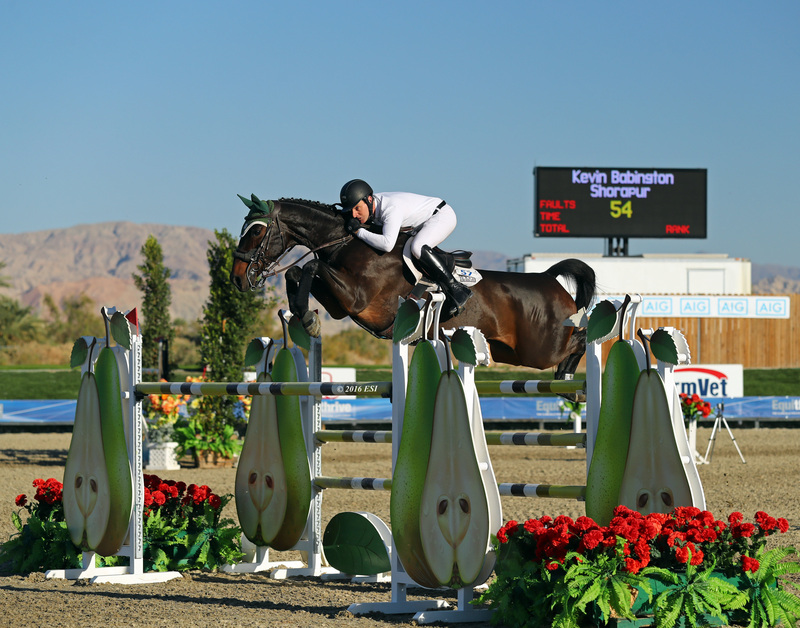 Rich Fellers dominated the Welcome Stake to kick of the FEI-4* Week last week piloting the infamous Flexible, owned by Harry and Mollie Chapman.“I showed Flexible in the Grand Prix Ring on the brand new footing installed here in Thermal prior to this show,” Fellers said after the win on the freshened up footing. “He is 22 years old and he had the longest stride of his illustrious career. Congratulations on the new ground.”In a ten-horse jump-off, they clocked in with the final clear round of the field in 39.51 for the blue ribbon. Second in the ribbons was Samuel Parot riding Atlantis, and third was Andrew Ramsay riding Stranger 30, owned by The Stranger Group. (C) ESI Photography. Rich Fellers and Flexible on their way to a $34,600 HITS Welcome Stake FEI CSI4* win. (C) ESI Photography. 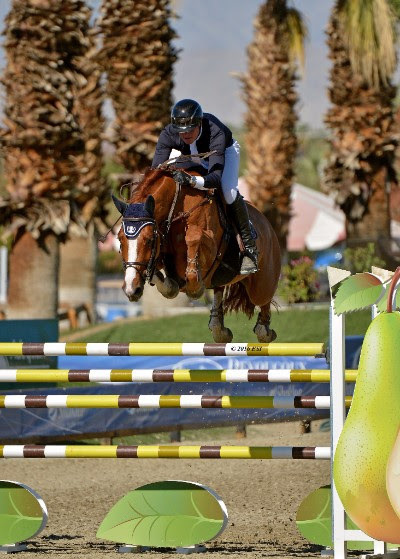 Guido Klatte Jr. and Qinghai on their way to a $52,500 Coachella Valley Classic FEI CSI4* win. 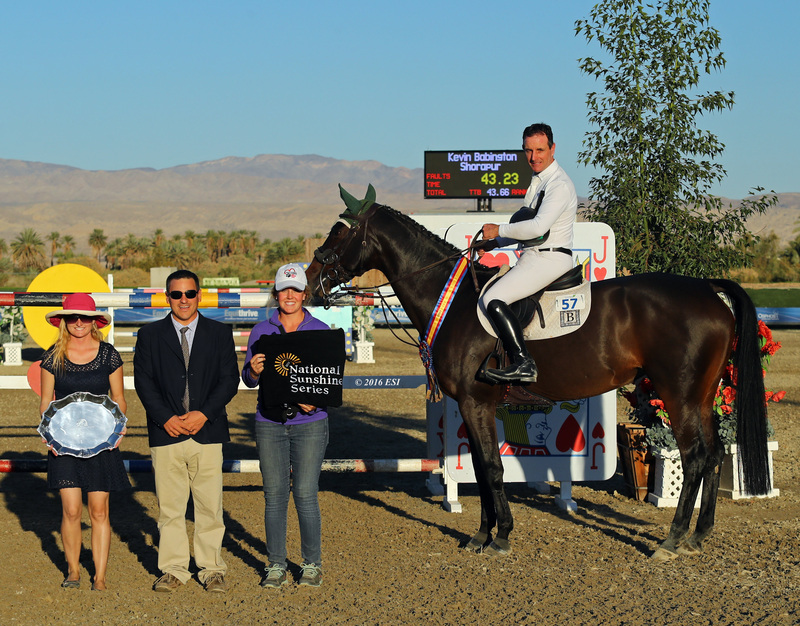 As the buzz of FEI week came to a median, Friday’s FEI class was underway to generate a weekend full of excitement.Guido Klatte Jr. took home the win at National Sunshine Series aboard Qinghai, owned by Guido Klatte Sr. They garnered the quickest trip out of only two clear rounds in the eight-horse jump-off. They clocked in at 39.75 for the lead. Nayel Nassar and Lordan followed just fractions of a second behind in 39.91 for second place. Third place honors went to Kevin Babington riding Double O Seven 7. Nassar and Babington battled it out all week. Nassar took home a ribbon in the top three of two FEI classes and Babington garnered a win or place in the top three in a plethora of classes over the two-week series. (C) ESI Photography. 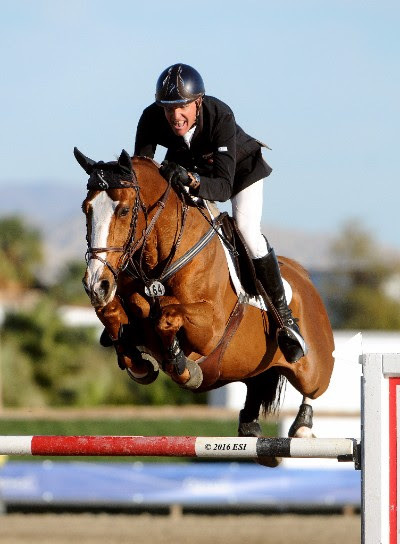 Guido Klatte Jr. winning the $52,500 Coachella Valley Classic. Wednesday’s Welcome kicked off an exciting week at HITS Desert Horse Park. Joie Gatlin took home the top honors with Rammstein, owned by Jasmine Weber Tally.Second place belonged to Sarah Cillie riding Amiracle, owned by DP Racing, and rounding out the top three was Laura Hite aboard Solos Consept. (C) ESI Photography. Joie Gatlin and Rammstein on their way to a $5,000 Johnson Horse Transportation Open Welcome win. Click here for the results of the Zone X Equitation Finals.